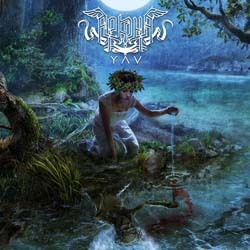 Russian pagan folk metal band Аркона (Arkona) returns after three long years and finally releases the new album “Yav“. The Russian warriors revolving around the impressive front-lady Masha “Scream” Arkhipova have perfected their unique style. Like never before, the band interweaves brutal metal riffs, pounding drums and folk melodies, the latter played mostly on authentic and medieval instruments. Sweeping and profound songs, epic compositions and dream-like atmospheres create the distinctive and enthralling sound of Arkona. “Yav” offers 70 minutes of original, majestic and unique pagan folk metal and will crown Arkona king! It will be released by Napalm Records on April 25th, 2014 in various formats, already available on the label’s e-shop, where you can also listen to a short teaser. The beautiful artwork is by Gyula Havancsák.